Happy Monday, everyone! Yesterday we attended our nephew’s circumcision celebration. Her mother prepared tumpeng rice for our lunch together. All aunts and uncles were coming. It’s a special celebration for only close family. The bigger celebration will be held later, if my nephew’s pexxx has recovered totally. 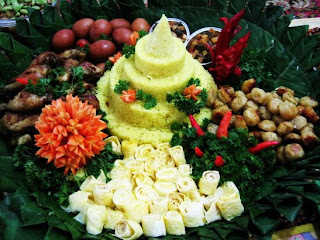 Tumpeng rice is a ceremonial dish of yellow rice served in a cone shape. When it served in any special occasion, it will be completed with other various kinds of food. 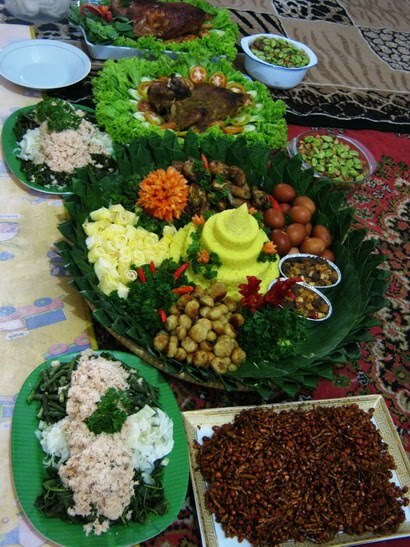 Tumpeng rice will also be decorated beautifully. It’s very inviting, right? is it tradition to celebrate after circumcision? and a bigger feast after recovery! this is quite an interesting tradition. what a gorgeous feast! oh my golly! this is indeed quite a tradition. What a colorful (and no doubt tasty) feast! When dancing dewdrops spangle the lawn. Of bat or swallow or anything! Wow, the food looks yummy. Thank you for sharing. It is nice to know other people's tradition. Gorgeous arrangement, I bet it all tastes good.! Yellow Lily, have a great week ahead! How to Locate a Reliable Handyman?